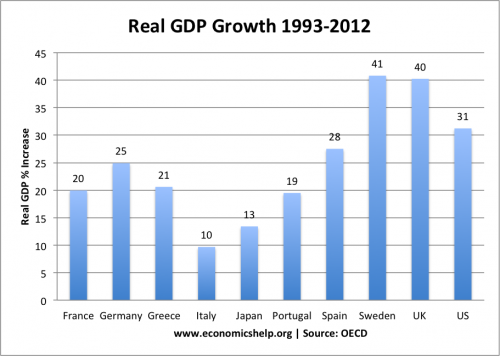 In the past 20 years, the Italian economy has stagnated compared to its main international competitors. Using different measures, such as labour productivity and relative GDP growth – Italy has fallen significantly behind. Despite low budget deficits (and primary surpluses) Italy is facing high bond yields and crippling interest payments. These high bond yields are in response to both the high levels of debt – but also the continued economic weakness. Italian productivity relative to the UK. 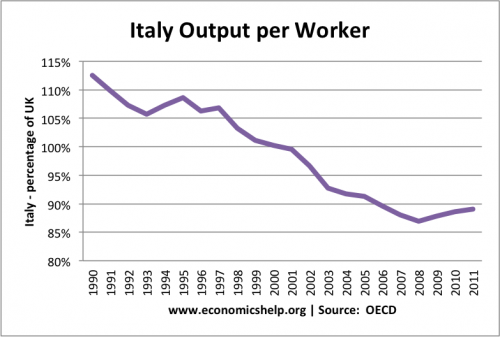 In the 1990s and 2000s, Italian output per workers has fallen behind it’s main competitors. It’s a similar story if we compare Italian productivity to France or Germany. 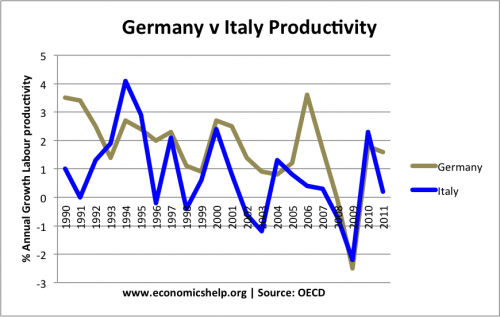 Italian productivity – growing slower than Germany. 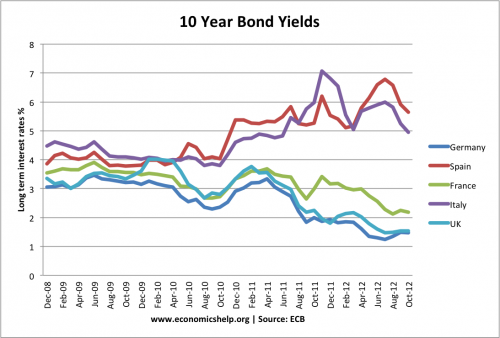 Higher bond yields a key factor in the Italian debt problem. 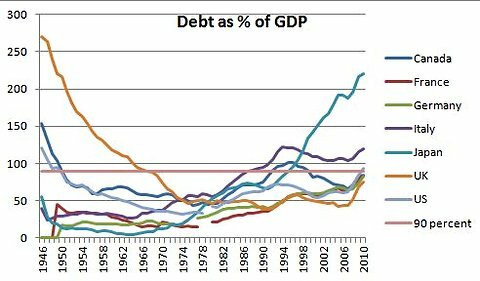 Despite the large total debt, Italy has a relatively low budget deficit as % of GDP. Lower labour productivity. The decline in labour productivity shown above is a key factor in the decline of Italian GDP. This is due to a combination of factors such as decline in education, poor management, and lack of incentives in the economy. Decline in Competitiveness. Italy has traditionally concentrated on producing low tech goods, such as clothing, textiles, handbags. These industries have lost competitiveness with China and Asia, where Italian firms have been unable to compete on low wages. They have not been able to diversify into higher tech industries like Germany or financial services like the UK. Role of Mafia. The mafia have always been there in Italian society. But, there is evidence they are increasingly active in the corruption of public funds, making it difficult to invest in the long-term improvement of the economy. Disunited Country. The relative decline has led to increased calls by the northern league for separation from the south. Failures of the Euro. Italy was one of the most pro-Euro economies. It was hoped joining the Euro, would tie Italy’s fortunes to Germany. But, that hasn’t happened, and in fact, the Euro has created extra problems for Italy. Being in the Eurozone has caused liquidity fears, pushing up Italian bonds, making Italy face crippling interest rate charges. Therefore, despite large primary budget surplus, they are facing difficulties in reducing debt to GDP ratio. Austerity measures introduced in response to debt crisis have caused a further fall in economic growth, with no obvious solution to falling GDP and rising unemployment. 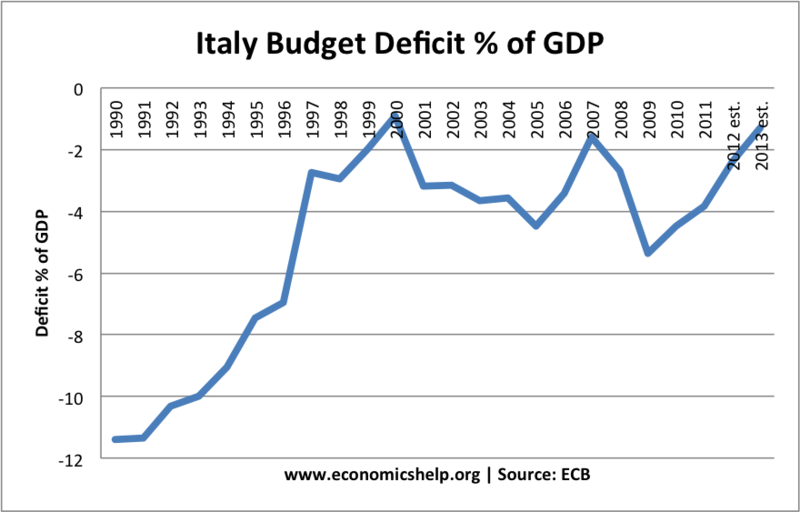 Evidence suggests austerity is self-defeating, but Italy keeps being pressured to tighten fiscal policy. Demographic changes. Italy has one of the lowest birth rates in the world. It is facing a rapidly increasing dependency ratio, which will place more pressure on government finances in the future. Statistical anomalies. Krugman write in ‘More on Italy‘ an explanation for drop in productivity. – Italy used to have many working on black market. Different legislation encourage people to declare more workers GDP remained unaffected, but quantity of labour rose – causing drop in labour productivity. This doesn’t explain poor performance of Italian GDP, but does show graphs that show by other measures, Italy’s relative export performance is not too bad. This entry was posted in economics and tagged italy. Bookmark the permalink.